ity, among them Aristotle, founder of Aristotelian physics, may have been the first to maintain the idea that "everything happens for a reason" and that theoretical principles can assist in the understanding of nature. While to a modern reader, many of these preserved ideas come forth as eminently reasonable, there is a conspicuous lack of both mathematical theory and controlled experiment, as we know it. These both turned out to be decisive factors in forming modern science, and they started out with classical mechanics. The medieval "science of weights" (i.e., mechanics) owes much of its importance to the work of Jordanus de Nemore. In the Elementa super demonstrationem ponderum, he introduces the concept of "positional gravity" and the use of component forces. Three stage Theory of impetus according to Albert of Saxony. The first published causal explanation of the motions of planets was Johannes Kepler's Astronomia nova published in 1609. He concluded, based on Tycho Brahe's observations of the orbit of Mars, that the orbits were ellipses. This break with ancient thought was happening around the same time that Galileo was proposing abstract mathematical laws for the motion of objects. He may (or may not) have performed the famous experiment of dropping two cannon balls of different weights from the tower of Pisa, showing that they both hit the ground at the same time. The reality of this experiment is disputed, but, more importantly, he did carry out quantitative experiments by rolling balls on an inclined plane. His theory of accelerated motion derived from the results of such experiments, and forms a cornerstone of classical mechanics. 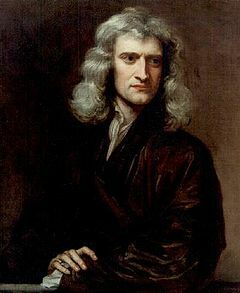 Sir Isaac Newton (1643–1727), an influential figure in the history of physics and whose three laws of motion form the basis of classical mechanics As foundation for his principles of natural philosophy, Isaac Newton proposed three laws of motion: the law of inertia, his second law of acceleration (mentioned above), and the law of action and reaction; and hence laid the foundations for classical mechanics.